- If you ask hikers which month is their least favorite to hike in, a good number will tell you November is. The woods look dead, it gets dark before 5PM, it's getting colder and windier by the day, and the trails and water crossings can be icy. - Luckily, for the second straight year, November has been pretty tame, in fact, other than this past April, the temperatures and trail conditions have been excellent since the end of the 2015 winter a year and a half ago. This Saturday was no exception, temperatures almost hitting 50 on Mount Washington with very light wind, basically it was late summer conditions above treeline! 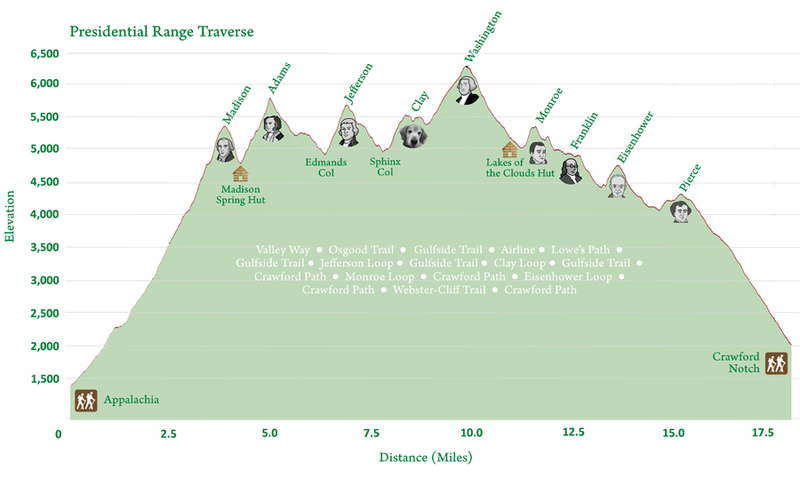 Elevation profile, with presidential (and Franklin's) head shots, wait a second . . .
Hikers making there was up a snowfield. In the middle of winter and early spring this takes on a very different feel. One of the very few times I had to break out my crampons was here in 2010, this forms a steep slope where a fall can send you tumbling fast and out of control.